After many small outdoor scenes, it was time to paint on a bigger canvas, purely from the heart. I had been reading about the German painter Franz Marc who painted expressionistic horses and other animals. 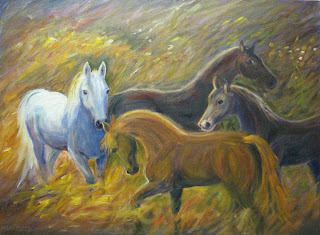 The idea was so appealing that I wanted to try it too, even though I tend to paint more realistic.....this is afterall my herd, even though I set out to paint just horses, the ones I know emerged. Make me one! Make one of BUNNY! ? ?